Most kayakers would never think of swapping their main ride for a SUP kayak combo, much less think of doing so on a 40 mile paddling trip. Fortunately for us, our SUP-curious friend Charlotte is both open minded and adventurous. 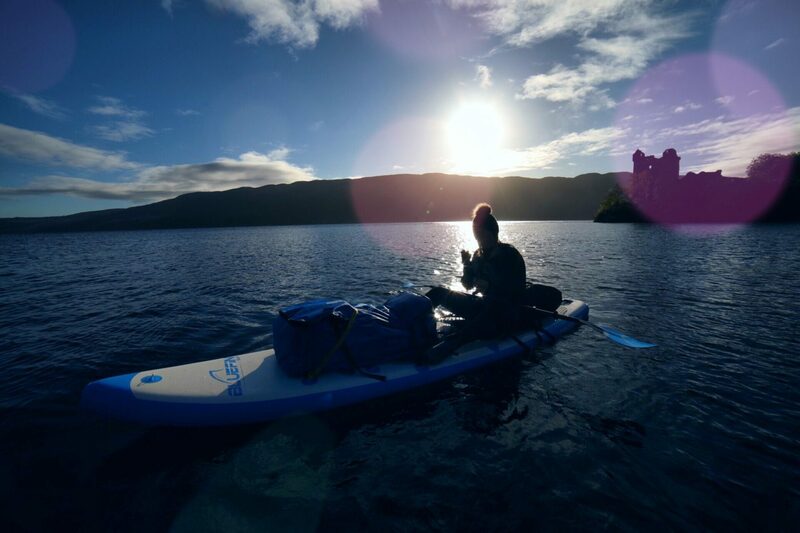 On her recent expedition through through the Caledonian Canal, Charlotte traded her sea kayak for a 12’ Bluefin Cruise. Not only that, she completed the majority of the route using our kayak conversion kit rather than stand up paddling. Charlotte’s take will be useful for anyone trying to decide whether a SUP Kayak hybrid is right for them. Better still, it may surprise die hard kayakers. To give you a little background, Charlotte is an experienced sea kayaker and all around outdoorswoman. She is used to putting in the miles with a kayak paddle and has the delts to prove it. 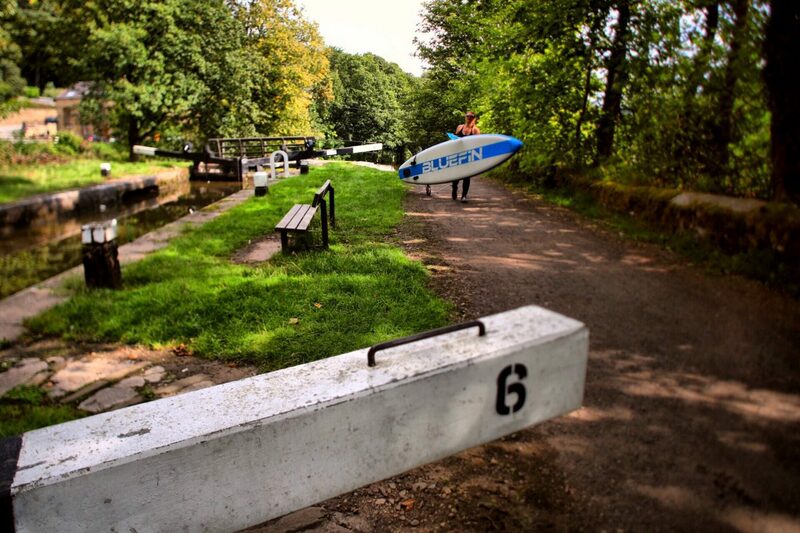 She had only owned her SUP for 6 weeks before packing it up for Scotland, talk about gusto! Why paddle a SUP seated rather than standing? For the simple reason of familiarity, Charlotte chose to paddle seated for most of the trip. 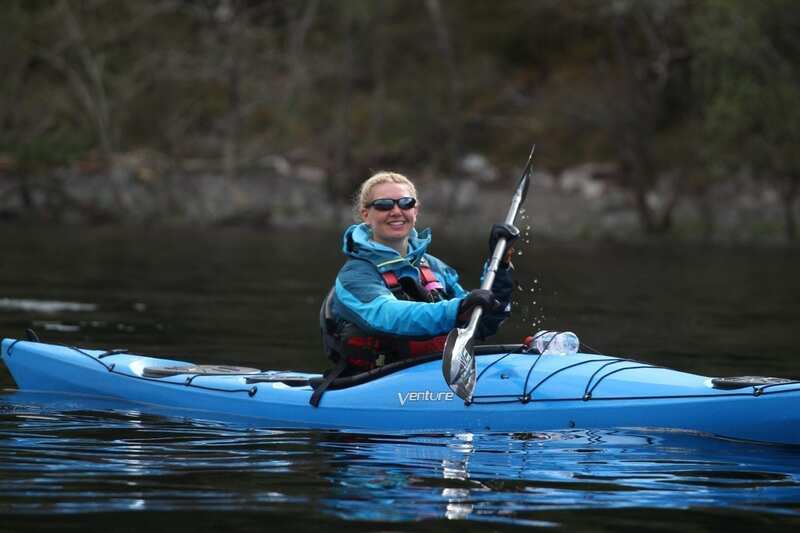 She and her partner Ian had 3 days to paddle 40 miles from Loch Lochy to Inverness. It was easier to get up the necessary speed in the paddling stance she knew especially considering the heinous weather they were battling through. Charlotte alternated between seated and kneeling every 2 hours or so. One of the main practical differences between a kayak and a conversion kit is the lack of foot pedals. For this reason, taking it in shifts is easier on your lower body. Switching the conversion paddle end for the SUP handle is simple enough to do on the go. All loaded up and ready to go, the SUP’s bag is great for stashing gear. How did the SUP perform compared to a sea kayak? The weather in the Great Glenn changes rapidly, particularly in Loch Ness which actually has its own lifeboat station. In the span of a few minutes things can go from sunny and calm to giving you an absolute battering from wind and surf. Charlotte told me that in rougher weather, at times she actually felt more relaxed on the paddleboard than in a sea kayak. It’s easy to stabilise yourself on bigger waves and correcting after being caught from the side is quick. Sea kayaks are tippy compared to a big, stable inflatable SUP. No spray deck or safety cord required. Although you are more exposed, It’s a lot harder to capsize a SUP than a kayak. Self-righting if you did capsize would be far easier, no rafting up required. The finest waterfront dining Loch Ness has to offer. Any tips for kayakers considering this? Obviously we aren’t advocating that a SUP with a conversion kit can take the place of a sea kayak entirely. It is a Stand Up Paddleboard after all and it’s primary use will always be to paddle while standing. What we are saying is that even career kayakers can enjoy a conversion seat and the versatility it provides. Paddleboards and kayaks both have their place, it all comes down to the individual and what kind of trip you’re going on. It’s also nice to know that if you do choose to travel with a paddleboard, you aren’t restricted to standing on 2 feet the entire time. iSUPs are easy to carry even when inflated which makes portages super easy. When is a SUP/Kayak conversion kit useful? 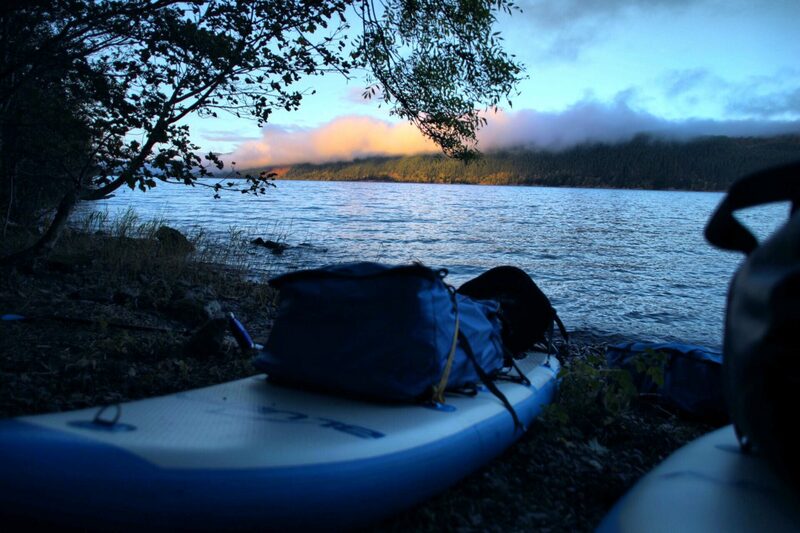 Shipping a sea kayak abroad is not a simple or cheap thing to do so if you would like to get some paddling in on your travels, an inflatable SUP has a clear advantage. If the trip is more about leisure than serious mileage, or if you don’t mind pounding at least some of those miles out standing, a SUP and conversion kit is just the job. If you’ll be paddling seated no more than a couple of hours at a time and you’d like to try different stances, the kit is ideal. If you’d like the option to pack up and head elsewhere mid-expedition, it’s easier with the iSUP because you can just hop on a bus. If you are a SUP-curious kayaker, you know you can always paddle home the old fashioned way if you’ve got a conversion kit with you. 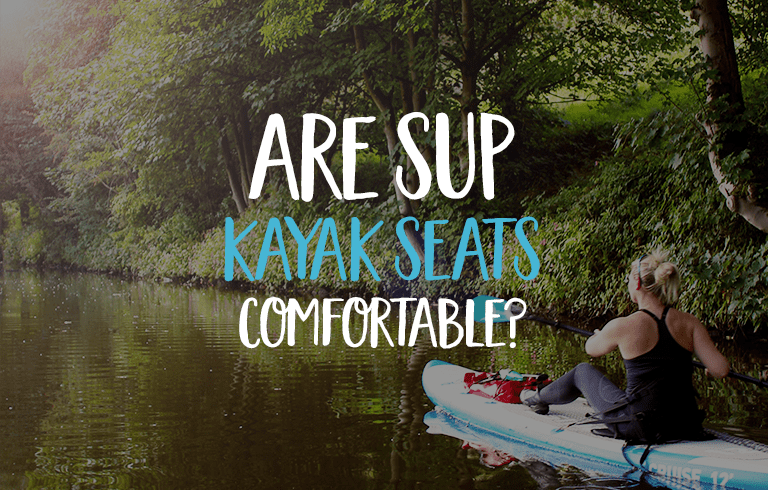 We’d love to hear your thoughts on using a SUP for seated kayak style paddling and where you’ve tried it so please give us a shout in the comments below. Charlotte Lever put our board and conversion kit to the test and took the time to tell us about it. We loved hearing her first hand account of how our gear dealt with Loch Ness and look forward to more tales of adventure in the future! This entry was posted in SUP Tips. Bookmark the permalink.